Our societies evolve faster than ever and as we recently stated, we want to ensure that these developments go well for both us as the people and our planet in general. The first step in understanding global change is acknowledging the hyperconnected societies we all live in. The second step is understanding what kind of roles platforms play. That is why we have gathered our platform related blogs and publications to this post. Our argument in brief is: platforms bring with them new ways of doing business and consuming services. Simultaneously, they fundamentally change the ways our lives are governed and regulated. 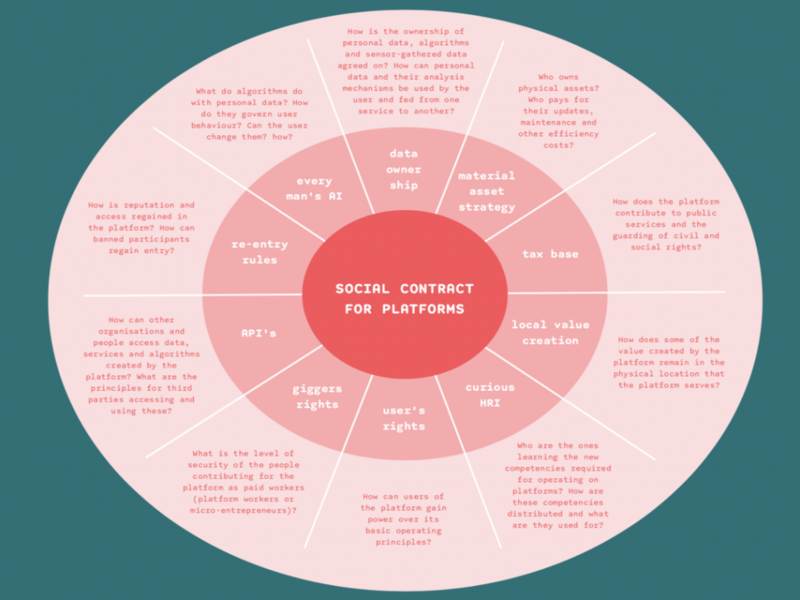 At the moment, we trust that platforms self-regulate, but we need to start having serious discussions on platforms and their societal impacts – from API’s to data access policies to discussions on users rights for choice. We have addressed these questions in projects with Fortune 500 institutions and leaders of progressive governments, and increasingly see the demand for societal insights from leaders in government and business alike. These are the topics we will be addressing in the Impact on society and key enablers -session during the Platform Economy Summit in Berlin. If you are at the summit, come meet our team! If you missed the event this year, drop us a line. Earlier this year our senior expert Johannes Koponen gave a long look at platforms. He argued that the business dynamics are under major transformations and this affects also the way traditional platform businesses are operating in the markets. Interested in what was the secret ingredient of the first generation platform businesses, why the competitive advantage of data is disappearing or the fall of platform business model? Have a look. So the change is happening, but how can we make sure the future is a hyperconnected paradise rather than dystopia? We in Demos Helsinki have identified four theses that bring to life the Nordic promise of a hyper-connected society. It all begins with the concept of trust. The topics covered are the tech shaped societal institutions, the digital governance of platforms, the future of LLCs and the successful value creation models in the world of hyperconnected tech. Check them out below. In a hyperconnected society, human beings, machines, and their surroundings are connected by trillions of tiny sensors. You may have heard about this fast-developing phenomenon under a different name, such as the Internet of Things, Connected Devices or Programmable World. Cheap, abundant sensors make the merging of digital and physical realities possible. Hyperconnected technologies develop fast, and their development is not only about computers: they shape our lives, norms, values, and behaviour. The Nordic Digital Promise is a publication that aims to inspire politicians, officials, entrepreneurs and a broad range of people to see the social opportunities that these new technologies offer. If this caught your attention, dive in. The Future as Told Through the Garden and the Streets is a Demos Helsinki publication that presents two scenarios for the hyperconnected Nordic societies of 2015-2040. The hyperconnected planet, technological development, our changing relationship to physical world and the new opportunities for a good life within the planetary boundaries are among the topics covered. The scenario report also investigates 5 most important tensions in the future of hyperconnected society. Wondering, which those are? Come find out. Demos Helsinki is a leading Nordic think tank, working together with the public sector, private sector, and NGOs. We want to impact the ongoing global transformations actively and aim to build sustainable and fair post-industrial societies. We are in constant search for strong and committed global partners to join us in building sustainable and fair post-industrial societies.